I'd like to start out by apologizing to all of my Round of Words in 80 Days friends for my abrupt absence over the past two and a half weeks. Life has been hitting me hard. If you'd like to know more about my situation, you can find a link to this post here. Needless to say, my progress in RoW has been as scant as my blog posts. I've gotten little to no work done toward any of my goals, but I'm ready to turn things around this week. The loss of these first 17 days has caused me to reevaluate some of my goals, and to make one significant change. As I, and likely many of you, prepare for NaNoWriMo, an assessment of my writing situation was needed. My RoW plan called for my preparation toward a brand new novel. However, the loss of time, and reflection upon my current situation in my writing career, has driven me to go rogue. Typically, NaNoWriMo "requires" that the 50,000 words be in a brand new project. Instead, I'll be using my 50k to finish last year's NaNo novel. 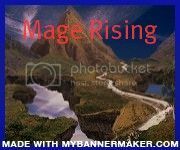 I'm currently at between 60,000 and 65,000 words, and I'm sure that the completion of the draft will require at least 50,000 more, so my NaNo goal is to finish "Mage Rising" (working title). I'm sure I could use all the motivation I can get to push through the month of November, so if any of you are participating, please friend me! Under the "Connect With Me" sidebar, I have a link to my NaNoWriMo profile, so look me up when you get a minute. As far as the rest of my RoW goals, I've made little progress, so I'll leave updates on those to my Sunday update. How are your goals coming? Accomplished anything crazy? Leave me a comment so we can share in your glory! As much as I hate cliches, I have to admit that I'm beginning to feel like I've been living in the middle of one for longer than I'd care to admit. It's true... I'm stuck at a crossroads. The worst part isn't that I can't make the decision, but that I'm still staring back at that crossroads after the decision, trying to decide if I made the right one or not. I've posted a little bit about this in previous posts, but I'd like to share a little of my current personal situation with all of you. I've been working in a management position at a local non-profit for over two and a half years now, and for the majority of the last two years I've been very unhappy. I don't want to go into details, but suffice it to say that the company hasn't been meeting my expectations, and vice versa. Meanwhile, my wife has been on-again, off-again about going into the military. We currently have two daughters, aged four and six. Circumstances kept my wife from joining until now, but most if not all of those circumstances no longer apply. Five months ago, my wife came to me, finally sure that she was ready to join, and was seeking my blessing. Because of her fluctuating desires, I told her I'd support her if she could prove that she was really committed. Over the next months, she proved it. Fast forward to September 12th, when my boss issued me a 90-day performance improvement plan, essentially a "ship up or ship out" ultimatum. Later that same week, my wife came to me again, decisive in her desire to move her ship date up from March to October/November. Part of the reason I hadn't been freaking out about her leaving was the length of time before her ship date. I still had six months to get used to the idea, and suddenly we're looking at her leaving in weeks instead of months. I soul-searched, and told her I was okay with the expedited date. What's not to like, right? I get to stay home with my kids, give them the attention they need, and I get to finally embark full-time on my writing career. Well, this has to come at the sacrifice of proximity to everyone I care about outside my wife and kids as I follow her cross-country (or further!) to let her live her dream. All along the path of preparation, I have many family members complaining about her decision to me, I believe to try to get me to change her mind. These past few weeks have been very difficult for me, and I'd fallen into a bout of depression, at least until a couple days ago. I withdrew from everything, including writing, work, family... I was an introspective hermit. It always amazes me how, when you get down on yourself, you withdraw from all the things that will make you happy. It makes me wonder why God would design us that way. Back to the crossroads. I'm nearly certain I made the right decision, but those other paths look so inviting. To visualize, it feels like I could have turned left or right along the edge of a dense forest, following the sunlight and clear flowing streams, but instead I chose the dark, lonely path through the forest. I know that, eventually, this path should open up into a beautiful meadow, but it's hard not to doubt my choice as the darkness closes around me. I just have to stay as positive as I can, and look at the path ahead as an adventure, and not a mistake. Have you ever had a time in your life when you felt so uncertain about a decision you made? How did it turn out? What did you do to weather the storm? I'd love to hear other people's stories on this subject. Round 4... Here we go again! Now that I have successfully completed my first Round of Words in 80 Days, I'm looking forward to taking slightly larger steps into the world of writing during Round 4. I'm going to be adding more areas to my life, and striving to make small progress as often as possible toward each of these goals each week, no matter how difficult life might be. My writing goals for Round 3 were aggressive, asking myself to finish my first draft of my 2011 NaNo novel, which still had 60,000-70,000 words left to be written. I'm now at just shy of 62,000 words out of an expected 110-120,000, so I still have much work left to complete this goal. 1. My goal, for this WIP, is to write another 20,000 words, reaching 82,000 (due 12/19). 2. My 2012 NaNo novel concept fleshed out (10/7). 3. Character sketches for main characters designed (10/14). 4. Outlines of first ten scenes written out (10/21). 5. Any additional preparation work for NaNo novel completed (10/28). 6. Write 50,000 words toward NaNo novel (11/30). I also want to keep up with my blogging responsibilities, which I have really begun to enjoy (when I have the time!) The last couple weeks of Round 3 I faltered a little, but I'm hoping to start strong in October, so I have a little more leeway in November, should I need the extra time for NaNoWriMo. 7. Write an average of 3 blog posts per week throughout the eleven and a half weeks of Round 4, for a total of 34 posts. 13. Reduce weight to 220 or lower. 14. Be able to run a 7-minute mile, and a 27-minute 5k. 15. Be able to complete 25 push-ups in 1 minute. 16. Be able to complete 45 sit-ups in 1 minute. 17. Be able to complete 1 pull-up. 18. Spend at least 8 hours total getting the yard and garage ready for the winter (10/31). 19. Take care of dirty (and clean if applicable) dishes at least four nights a week. 20. Make a family dinner once a week. 21. Run at least one load of laundry each week. 22. Help with bedtime for the girls at least three nights a week. 23. Invite someone over for dinner once a week. 24. Contact my real estate agent to discuss starting the process of putting the house up for sale (10/15). 25. Pray every day, even if only for a minute. 26. Read an average of one chapter of the Bible per day, for 80 chapters total (12/19). 27. Revamp all site cleaning checklists to incorporate changes due to quality concerns (10/1). 28. Finish rough draft of 2013 annual plan goals (10/5). 29. Complete annual review of crew supervisor (10/8). 30. Complete third-quarter performance review of all employees (10/15). 31. Finish rough draft of 2013 budget (10/19). 32. Perform onsite quality audits of all external contracts monthly. 33. Perform onsite quality audit of corporate office weekly. 34. Finish all 15 store cleanliness audits (12/19). 35. Complete fourth-quarter performance review of all employees (12/19). If you somehow managed to make it all the way through this monstrous post, thanks! I'd love to hear about your goals for the round as well, and if you'll be participating in NaNo this November, so we can friend each other! Seem to be unnaturally nice. Seem to actually care about each other. Pick each other up after failures. Have immense knowledge of all aspects of the writing, revision, and publishing process. Can it possibly be true that these writers are actually all these things? Well, after six weeks, I'm come to the conclusion that... it's all true. I've had an up and down half-round. I've had weeks that were so productive that I was beaming as I wrote my blog posts. I've had weeks that were so unproductive that I saw no point in updating at all. Through all of it, all of my fellow RoW participants were there, commenting on every post, sharing in my good and bad moments. So... before I go into all the end-of-round goals I didn't accomplish, I'd like to take a moment to thank every one of you who took a minute here or there to stop by and write a comment. It's very validating to me to receive these comments, to know that you all are supporting me, someone you barely know. I've spent many hours over the past six weeks doing the same with as many of you as possible, and I feel like I've begun developing friendships with you as well. I am truly looking forward to Round 4, where I can take everything I've learned and grow from the experience. I hope to see you all then! Please feel free to comment about your round as well, either to share in your commiseration, or to shine in your success! Writing - I will push toward having completed the first draft of my 2011 NaNo novel. This will be exceptionally difficult, as I believe I still have at least 50-70,000 words left to reach completion, but I feel this is necessary, as my desire is to start the second book in the series for the 2012 NaNo. I managed to write about 12,000 words onto my 2011 NaNo novel. I didn't come close to completing the novel, but I did make great progress in comparison to the past eight months since NaNo came to a close. Blogging - I don't really have an end-of-round goal for blogging, but I would like to get to the point where I feel comfortable writing blog posts on a regular basis. Having a few followers would also be nice! I have written fourteen blog posts since I started RoW in mid-August, which accounts for around two posts a week. I feel like I have gained much insight in the blogosphere and how to connect with other bloggers around me. I've also gained 5 followers, which was more than I was expecting, so thank you for the follow! Exercise - While not excessively overweight, I weigh more than I am comfortable with, and my goal is to lose 5 pounds by the end of this round. I did not do very well on this goal. I did get some exercise in, but my eating habits caused me to gain a couple pounds instead of lose. I'll be expanding on this goal for Round 4. Housework - Talk about running a treadmill, housework will never cease, but I want to get to a point at my house that the house is at least free of clutter every night before I go to bed, and my wife is happy with the assistance I give the household. I made some serious progress in this area, which makes me quite happy. I've been helping more with various activities, from dishes and cleaning the kitchen to helping keep the kids' areas uncluttered. I still have a long way to go on this goal, but the progress made was wonderful. I received comments from multiple people stating that they themselves would not be able to handle this kind of level of multitasking. What they didn't say was that I probably wouldn't be able to handle it either. Of course, my commenters don't know me very well yet, so they couldn't know that for sure either way, right? Well... if you were thinking that failure was imminent... you were right. Failed might be a strong word, but I sure didn't pass all my goals with flying colors. I'm actually not going to go into detail about the end-of-week goal progress, because very little happened on my goals the second half of the week. Between work, and the pressures there, and a weekend packed with activities not conducive to getting anything accomplished, it was a dismal few days for my goals. I went from trying to squeeze the balloon... to the balloon squeezing me! I'm going to forget last week existed. Writing - I will write something toward finishing my as yet untitled book from NaNo last year, even if only 50 words, every day. This Week's Goal: Get from 61,172 words to 63,500 words in my NaNo novel. Reading - I will read at least 10 pages of a book each day. This Week's Goal: Read to page 175 of Battle Royale. Blogging - I will write at least three blog posts each week, one of which must not be ROW80-related. This Week's Goal: Write my Wednesday RoW update, one miscellaneous post, and keep up with reading my subscribed blogs throughout the week. Exercise - I will get "real" exercise for at least 30 minutes, three times a week. This Week's Goal: Get out for at least one walk with my kids this week. Housework - I will, in some small way, make my house look better each night than it did the previous night. This Week's Goal: Try to keep the house as clean as it is when my wife leaves for California, if not cleaner. It's not often that I find occasion to read a book that, in all respects, appears to be a philosophical text. However, I also don't pass up a book recommended by a friend, as "The Power of Paradox" had been, so I decided to give this book a try. This book, written by a local retired pastor, W. Brewster Willcox, discusses in depth the idea that the Bible's stories are often full of paradoxical concepts which people outside of Christianity often use as proof that the Bible is either a collection of non-literal documents, or not inspired by God at all. Willcox uses this book to help create an understanding that a paradox does not imply two things that cannot coexist, but instead two ideas that seem not to be able to coexist. These seemingly conflicting ideas or circumstances are in fact quite compatible, but difficult to see because of our narrow viewpoint or understanding of the subject matter. The central tenet behind Christianity as we understand it today is that Christ, the son of God, died through crucifixion and was resurrected three days later and ascended into heaven. This, Willcox asserts, "is the ultimate paradox of life, of creation: sometimes when things look bad they're actually very good." The way that Willcox goes about making his argument is quite unique. His background in theoretical physics leads him to spend a great deal of time comparing the paradoxes of Christianity to the conflicts between various theories in physics, the greatest of these being the inability to reconcile the theories of general relativity and quantum physics. For those of you who have even a little background in physics, you are aware that, when taken to extremes of size, Einstein's theory of general relativity falls apart and quantum mechanics takes over, and vice versa. The problem with this is that many of the consequences of each theory conflict with the other, leaving one of the greatest paradoxes of science. How can we use experimentation to prove that both theories are correct, and yet yield conflicting conclusions about the universe around us? I have bad news for you: Willcox doesn't solve any of life's greatest mysteries in this book. What he does do, however, is help the reader to open his mind to an understanding that conflicting ideas within the Bible are not mutually exclusive, and can actually work in tandem to create a deeper understanding of Christ's love for us. Furthermore, Willcox has written a lengthy section on "muddling through," as he calls it. The idea revolves around another paradox that affects not only churches, but all businesses and groups in today's increasingly connected society: the more information you have to base a decision on, the more difficult it becomes to make the decision. He goes on to discuss how, instead of bogging down with information overload, we muddle through with a less than accurate picture, and this process causes us to make smaller changes. These smaller changes, in turn, build on each other over what can be a very short period of time to create huge positive change. In fact, muddling through with small changes makes more of a positive effort in the long run, because with small changes, nothing can go drastically wrong. Would I recommend this book to you? That would depend upon you. This book is not for those who are looking for a light read. This book is also not for those who don't have a base understanding of physics, as many of the examples use physics stories to illustrate larger points. However, I would recommend this book to anyone who truly questions the seeming contradictions in the Bible, and sees them as sticking points to growing in her religion. Despite its difficulty, I gained a great deal of insight from this book, and believe you could do the same. About two months ago I was seated in my boss's office at Goodwill, where I work. Financially, things had been going poorly for the past two months, and some evidence of quality issues were starting to pop up as well. My boss asked me if I still wanted to work at Goodwill, to which I responded that I did, of course. He asked why I wasn't fixing some of these problems, which had a tendency to keep popping up now and then. At first I had difficulty determining how to describe the feelings I was dealing with in relation to the department and its host of problems. Then I thought of a balloon. It was a nearly perfect analogy, in my opinion, to trying to squeeze a balloon down to a smaller size. The goal is to reduce problems in all areas of the department. However, whenever I would focus on one problem, essentially squeezing that part of the balloon, another problem would pop up somewhere else. It's no wonder people swing so hard on the Whack-a-Mole game... never knowing which part will pop up next is incredibly frustrating. Getting back to RoW80, I find a similar type of frustration in putting enough focus on each area of my life to meet all my goals. Trying to balance work, a wife, kids, and various scheduled events with writing, reading, blogging, exercise and housework has been a fascinating challenge for me. Please don't get me wrong... I love every minute of it. I'd had an unusual drive the past three days, a drive to succeed at everything. I'm running myself ragged, scheduling every minute of my day, from the moment I wake up to the moment I fall asleep. I'm getting exhausted, but it's not really slowing me down. Not yet, at least. I've been quite productive so far this week, if you don't count Sunday. Sunday was my trip to the Detroit Tigers game, and was worth every minute of wasted time. Monday I hung around the house while my wife took the kids to her family's Labor Day cookout, and I got a load of writing, housework and blogging completed. I'm still trying to catch up on reading all of your blogs, but I'll get there... I think. I can't wait to see what the rest of this week will bring. Tell me your successes, and let us cheer each other on to victory! Writing - I will write something toward finishing my as yet untitled book from NaNo last year, even if only 50 words, every day. Write at least five days, and shoot for a wordcount goal of 65,000 - cutting down the overwhelming goal of last week. 9/2/12 - No writing accomplished. 9/3/12 - Wrote approximately 1600 words. 9/4/12 - Wrote approximately 1000 words. 9/5/12 - Wrote approximately 150 words (so far). Reading - I will read at least 10 pages of a book each day. Next Week's Goal: Read at least five days, and get to page 120 of Battle Royale. 9/2/12 - No reading done. 9/3/12 - Read 11 pages to page 40. 9/4/12 - Read 1 page to page 41 - sad, I know. Blogging - I will write at least three blog posts each week, one of which must not be ROW80-related. Next Week's Goal: Write my two RoW80 post, my book review of "The Power of Paradox", and one other post. 9/3/12 - Wrote Sunday's RoW update post. 9/5/12 - Wrote Wednesday's RoW update post. Exercise - I will get "real" exercise for at least 30 minutes, three times a week. Get at least three prayer walks, and one aerobic exercise routine. Housework - I will, in some small way, make my house look better each night than it did the previous night. Keep up with dishes as best as possible, work on reorganizing entertainment center area in basement, and organize garage. 9/2/12 - No housework completed. 9/4/12 - Emptied the dishwasher, reloaded and ran another load of dishes, picked up all the DVD cases and loose disks on the entertainment center, reorganized and put them all away.